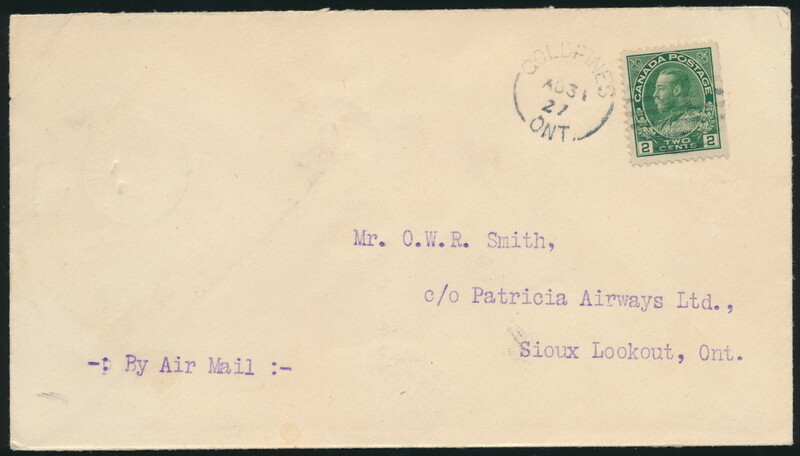 Lot 633 Canada #CL27 1927 5c on 10c Patricia Airways on cover, mailed Goldpines Ont on AUG.31.1927 to Sioux Lookout Ont, arrived there on SEP.1. The semi-official airmail stamp on back is tied by a green boxed Patricia Airways datestamp dated AUG.31. Very fine. Unitrade CV$450, sold for C$300.00 plus 15% buyer’s premium. 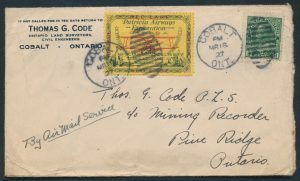 Lot 962 Canada #CL13 1927 Patricia Airways and Exploration Limited Commercial Cover, from Cobalt to Pine Ridge, Ontario. 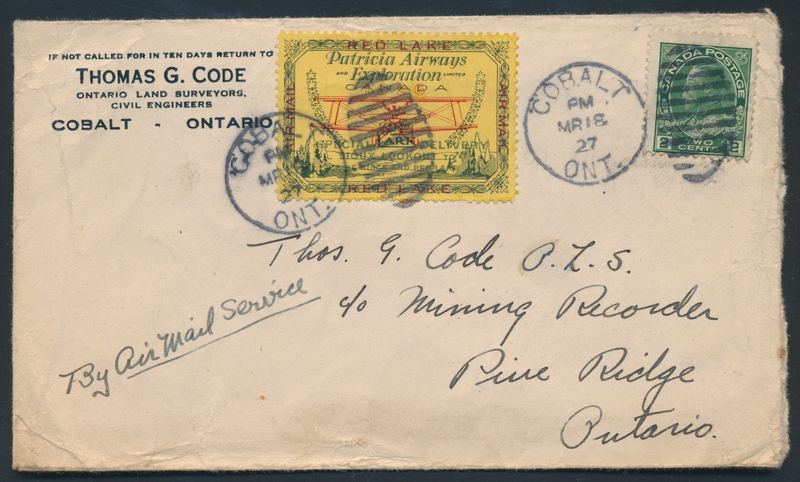 Mailed Cobalt MAR.18.1927, arrived at Rouyn P.Q. 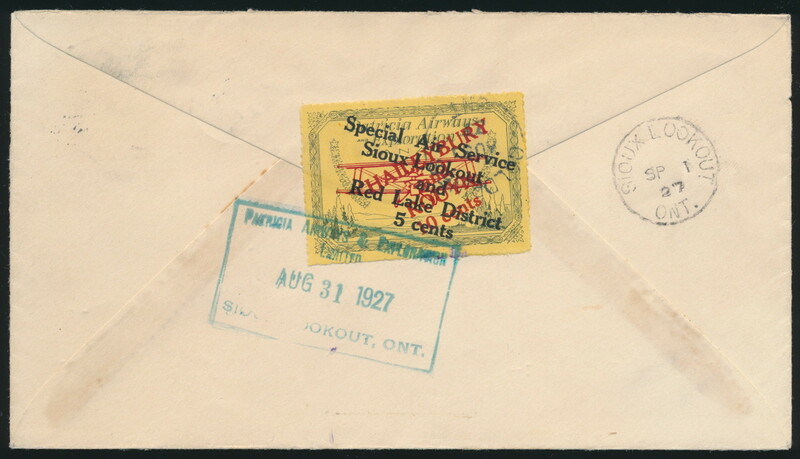 MAR.20 and has backstamps from Rolling Portage and Sioux Lookout on MAR.24. Opening faults at right and some creases and minor staining. Scott CV$250, sold for C$180 plus buyer’s premium. 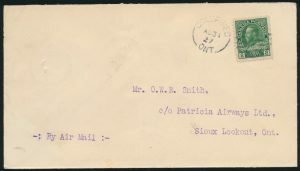 Lot 373 Canada #CL2 1929 Sioux Lookout to Red Lake Flight Cover, mailed on May 27, with a duplex cancelling the 2c Scroll issue and a c.d.s. 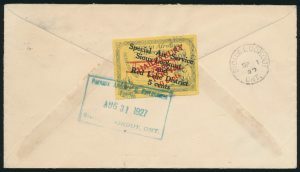 tying the CL2 stamp to front of cover. Back has a May 31 Sioux Lookout c.d.s. and a blue green Red Lake c.d.s. dated May 30. 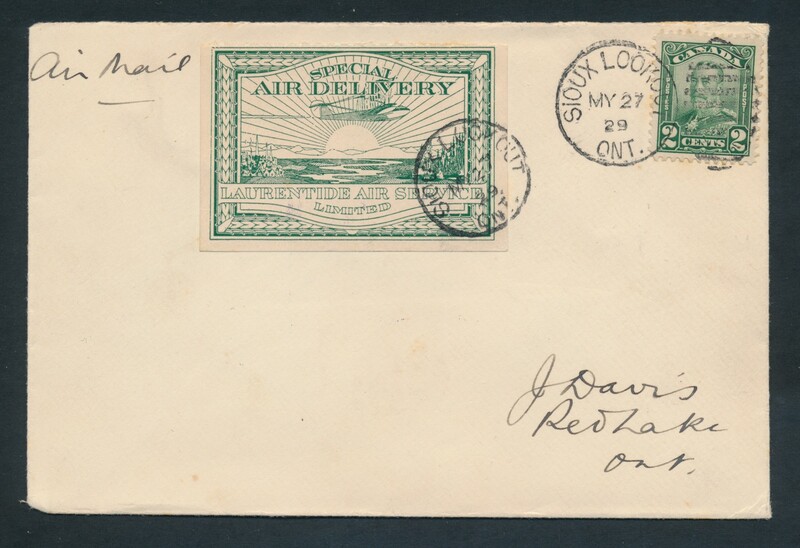 Back also has a purple Travel by Air, etc handstamp. Very fine. Unitrade CV$275, sold for $190 plus buyer’s premium.